Are you satisfied with the financial health of your orthopedic practice? Orthopedic marketing is the ability to communicate your skills as a doctor to the target group of clients you serve. It’s important to establish your identity as a health care provider within the community, not only networking with other physicians but also ensuring that your practice is well-known in the area for quality orthopedics care. You’ll have to settle several orthopedic practice questions when considering orthopedic practice marketing, such as which areas you would like to expand. There are four main parts of any marketing strategy: availability, ability, affability, and price. Of course, price may be the area where you have the least wiggle room. You have to pay a certain set amount for nurse practitioners and a certain amount for physician assistants. But you can change the other aspects of your orthopedic practice marketing strategy. Availability refers to the hours you offer and how easy you make it for patients to get an hour quickly. You can change the amount of time you give each patient, as well as the specific blocks of time that you have open during the day. Ability refers to your skill and the specific emphasis of your practice. Do you specialize in disc injuries? Make that known, and know who your niche of patients would be. It’s important to remember that publicizing your specialties to the people most likely to be interested will maximize their opportunities to get YOUR great treatment. Affability is all about creating a comfortable, welcoming doctor’s office where people feel that they are cared for. 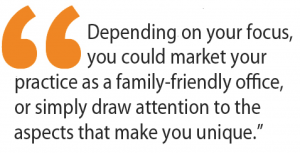 Depending on your focus, you could market your practice as a family-friendly office, or simply draw attention to the aspects that make you unique. People want to know that their doctors care about them, as well as the front desk people. Don’t ignore this vital aspect: many front desk staff that lack a kind, bedside manner will drive your prospective patients away. Be sure to look for staff who are friendly, communicative, and upbeat, as well as attentive to details. The technological skills that you need employed to execute your orthopedic marketing practice strategy can be contracted out to marketing professionals; you just need to keep these four areas in mind as you consider what to emphasize and where you can expand. Ask yourself: On a scale from 1 to 5, where would I rate my practice in terms of price, ability, affability, and availability? Then focus in on what you see as most important to improve the financial health of your practice. For more information on orthopedic practice questions and services for orthopedic doctors, you can contact us at Farotech by calling 267.387.6620 today. What Does It Really Take to Build a Brand?